Bloom is a REST API caching middleware, acting as a reverse proxy between your load balancers and your REST API workers. It is completely agnostic of your API implementation, and requires minimal changes to your existing API code to work. 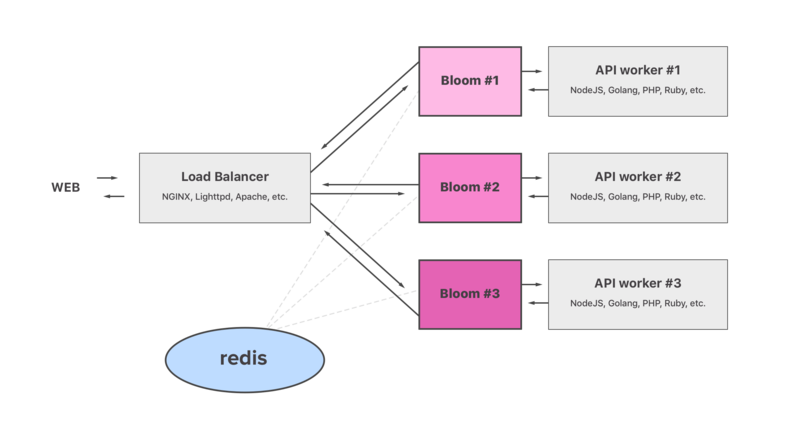 Bloom relies on redis, configured as a cache to store cached data. It is built in Rust and focuses on stability, performance and low resource usage. Important: Bloom works great if your API implements REST conventions. Your API needs to use HTTP read methods, namely GET, HEAD, OPTIONS solely as read methods (do not use HTTP GET parameters as a way to update data). 🇫🇷 Crafted in Brest, France. 📰 The Bloom project was initially announced in a post on my personal journal. 👋 You use Bloom and you want to be listed there? Contact me. The same Bloom server can be used for different API workers at once, using HTTP header Bloom-Request-Shard (eg. Main API uses shard 0, Search API uses shard 1). Cache stored on buckets, specified in your REST API responses using HTTP header Bloom-Response-Buckets. Cache clustered by authentication token, no cache leak across users is possible, using the standard Authorization HTTP header. Cache can be expired directly from your REST API workers, via a control channel. Configurable per-request caching strategy, using Bloom-Request-* HTTP headers in the requests your Load Balancers forward to Bloom. Specify caching shard for an API system with Bloom-Request-Shard (default shard is 0, maximum value is 15). Configurable per-response caching strategy, using Bloom-Response-* HTTP headers in your API responses to Bloom. Disable all cache for an API route with Bloom-Response-Ignore (with value 1). Specify caching buckets for an API route with Bloom-Response-Buckets (comma-separated if multiple buckets). Specify caching TTL in seconds for an API route with Bloom-Response-TTL (other than default TTL, number in seconds). Serve 304 Not Modified to non-modified route contents, lowering bandwidth usage and speeding up requests to your users. Bloom can be hot-plugged to sit between your existing Load Balancers (eg. NGINX), and your API workers (eg. NodeJS). It has been initially built to reduce the workload and drastically reduce CPU usage in case of API traffic spike, or DOS / DDoS attacks. A simpler caching approach could have been to enable caching at the Load Balancer level for HTTP read methods (GET, HEAD, OPTIONS). Although simple as a solution, it would not work with a REST API. REST API serve dynamic content by nature, that rely heavily on Authorization headers. Also, any cache needs to be purged at some point, if the content in cache becomes stale due to data updates in some database. NGINX Lua scripts could do that job just fine, you say! Well, I firmly believe Load Balancers should be simple, and be based on configuration only, without scripting. As Load Balancers are the entry point to all your HTTP / WebSocket services, you'd want to avoid frequent deployments and custom code there, and handoff that caching complexity to a dedicated middleware component. Bloom is installed on the same server as each of your API workers. As seen from your Load Balancers, there is a Bloom instance per API worker. This way, your Load Balancing setup (eg. Round-Robin with health checks) is not broken. Each Bloom instance can be set to be visible from its own LAN IP your Load Balancers can point to, and then those Bloom instances can point to your API worker listeners on the local loopback. Bloom acts as a Reverse Proxy of its own, and caches read HTTP methods (GET, HEAD, OPTIONS), while directly proxying HTTP write methods (POST, PATCH, PUT and others). All Bloom instances share the same cache storage on a common redis instance available on the LAN. Bloom is built in Rust for memory safety, code elegance and especially performance. Bloom can be compiled to native code for your server architecture. Bloom has minimal static configuration, and relies on HTTP response headers served by your API workers to configure caching on a per-response basis. Those HTTP headers are intercepted by Bloom and not served to your Load Balancer responses. Those headers are formatted as Bloom-Response-*. Upon serving response to your Load Balancers, Bloom sets a cache status header, namely Bloom-Status which can be seen publicly in HTTP responses (either with value HIT, MISS or DIRECT — it helps debug your cache configuration). Bloom is built in Rust. To install it, either download a version from the Bloom releases page, use cargo install or pull the source code from master. Ensure that your $PATH is properly configured to source the Crates binaries, and then run Bloom using the bloom command. Debian & Ubuntu packages are also available. Refer to the How to install it on Debian & Ubuntu? section. You might find it convenient to run Bloom via Docker. You can find the pre-built Bloom image on Docker Hub as valeriansaliou/bloom. Bloom will be reachable from http://localhost:8080, and Bloom Control will be reachable from tcp://localhost:8811. Make sure to properly configure the [proxy] section so that Bloom points to your API worker host and port. Important: make sure to spin up a Bloom instance for each API worker running on your infrastructure. Bloom does not manage the Load Balancing logic itself, so you should have a Bloom instance per API worker instance and still rely on eg. NGINX for Load Balancing. Once Bloom is running and points to your API, you can configure your Load Balancers to point to Bloom IP and port (instead of your API IP and port as previously). Bloom requires the Bloom-Request-Shard HTTP header to be set by your Load Balancer upon proxying a client request to Bloom. This header tells Bloom which cache shard to use for storing data (this way, you can have a single Bloom instance for different API sub-systems listening on the same server). If your API runs on a dedicated hostname (eg. https://api.crisp.chat for Crisp), do not forget to adjust your CORS rules accordingly, so that API Web clients (ie. browsers) can leverage the ETag header that gets added by Bloom. This will help speed up API read requests on slower networks. If you don't have existing CORS rules, you may not need them, so ignore this. Note that a shard number is an integer from 0 to 15 (8-bit unsigned number, capped to 16 shards). ETag: unique identifier for the response data being returned (enables browser caching); see MDN. Vary: tells other cache layers (eg. proxies) that the ETag field may vary on each request, so they need to revalidate it; see MDN. If-Match: used by the client to match a given server ETag field (on write requests); see MDN. If-None-Match: used by the client to match a given server ETag field (on read requests); see MDN. Note that you need to add both new request and response headers to your CORS rules. If you forget either one, requests to your API may start to fail on certain browsers (eg. Chrome with PATCH requests). Now that Bloom is running in front of your API and serving requests on behalf of it; your API can instruct Bloom how to behave on a per-response basis. Your API can send private HTTP headers in responses to Bloom, that are used by Bloom and removed from the response that is served to the request client (the Bloom-Response-* HTTP headers). Refer to the list of status codes on Wikipedia if you want to find the matching status codes. By default, Bloom sets a TTL of 600 seconds (10 minutes), though this can be configured from config.cfg. Then, when you need to purge the tagged responses for user with identifier 10012, you can call a Bloom Control cache purge on bucket user_id:10012. The flow is similar for bucket heavy_route:1203. By default, a cached response has no tag, thus it cannot be purged via Bloom Control as-is. How to install it on Debian & Ubuntu? Bloom provides pre-built packages for Debian-based systems (Debian, Ubuntu, etc.). Important: Bloom only provides Debian 8 64 bits packages for now (Debian Jessie). You will still be able to use them on other Debian versions, as well as Ubuntu. Bloom is built in Rust, which can be compiled to native code for your architecture. Rust, unlike eg. Golang, doesn't carry a GC (Garbage Collector), which is usually a bad thing for high-throughput / high-load production systems (as a GC halts all program instruction execution for an amount of time that depends on how many references are kept in memory). Note that some compromises have been made relative to how Bloom manages memory. Heap-allocated objects are heavily used for the sake of simplicify. ie. responses from your API workers are fully buffered in memory before they are served to the client; which has the benefit of draining data from your API workers as fast as your loopback / LAN goes, even if the requester client has a very slow bandwidth. In production at Crisp, we're running multiple Bloom instances (for each of our API worker). Each one handles ~250 HTTP RPS (Requests Per Second), as well as ~500 Bloom Control RPS (eg. cache purges). Each Bloom instance runs on a single 2016 Xeon vCPU paired with 512MB RAM. The kind of HTTP requests Bloom handles is balanced between reads (GET, HEAD, OPTIONS) and writes (POST, PATCH, PUT and others). As you can see, Bloom consumes only a fraction of the CPU time (less than 5%) for a small RAM footprint (~5% which is ~25MB). On such a small server, we can predict Bloom could scale to even higher rates (eg. 10k RPS) without putting too much pressure on the system (the underlying NodeJS API worker would be overheating first as it's much heavier than Bloom). If you want Bloom to handle very high RPS, make sure to adjust the cache.executor_pool and the redis.pool_size options to higher values (which may limit your RPS if you have a few milliseconds of latency on your Redis link — as Redis connections are blocking). How does it deal with authenticated routes? Authenticated routes are usually used by REST API to return data that's private to the requester user. Bloom being a cache system, it is critical that no cache leak from an authenticated route occur. Bloom solves the issue easily by isolating cache in namespaces for requests that send an HTTP Authorization header. This is the default, secure behavior. If a route is being requested without HTTP Authorization header (ie. the request is anonymous / public), whatever the HTTP response code, that response will be cached by Bloom. As your HTTP Authorization header contains sensitive authentication data (ie. username and password), Bloom stores those values hashed in redis (using a cryptographic hash function). That way, a redis database leak on your side will not allow an attacker to recover authentication key pairs. Can cache be programatically expired? Yes. As your existing API workers perform the database updates on their end, they are already well aware of when data - that might be cached by Bloom - gets stale. Therefore, Bloom provides an efficient way to tell it to expire cache for a given bucket. This system is called Bloom Control. Bloom can be configured to listen on a TCP socket to expose a cache control interface. The default TCP port is 8811. Bloom implements a basic Command-ACK protocol. Expire cache for a given bucket. Note that as a given bucket may contain variations of cache for different HTTP Authorization headers, bucket cache for all authentication tokens is purged at the same time when you purge cache for a bucket. Expire cache for a given HTTP Authorization header. Useful if an user logs-out and revokes their authentication token. Notice: before any command can be issued, Bloom requires the client to validate its hasher function against the Bloom internal hasher (done with the HASHREQ and HASHRES exchange). FarmHash is used to hash keys, using the FarmHash.fingerprint32(), which computed results may vary between architectures. This way, most weird Bloom Control issues are prevented in advance. If you find a vulnerability in Bloom, you are more than welcome to report it directly to @valeriansaliou by sending an encrypted email to valerian@valeriansaliou.name. Do not report vulnerabilities in public GitHub issues, as they may be exploited by malicious people to target production servers running an unpatched Bloom instance. 🎁 Based on the severity of the vulnerability, I may offer a $200 (US) bounty to whomever reported it.